Alongside Galaxy M20, Samsung also launched a toned-down variant in its Galaxy M series, the Galaxy M10 is an entry-level budget smartphone priced at ₹7,990. The Galaxy M series has two new smartphones and they both feature a new screen design called Infinity-V display. Here’s our hands-on with the Samsung Galaxy M10. The main highlight of the Galaxy M10 is its new notched design, Samsung calls it Infinity-V display that has a waterdrop-like on the top that offers full-screen experience. The screen is sized at 6.2-inch HD+ TFT display with a resolution of 1480 x 720 pixels covered with a scratch resistant Dragontrail Glass on top. As for its design, you won’t find a metallic or glass design, since it’s a budget smartphone, the build is all plastic. 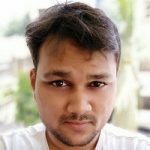 No, you don’t get a fingerprint scanner onboard, the Galaxy M10 lacks a fingerprint scanner while the Galaxy M20 has it. Speaking of its specifications, the Samsung Galaxy M10 equips an Exynos 7870 octa-core SoC which is equivalent to the Qualcomm Snapdragon 450. 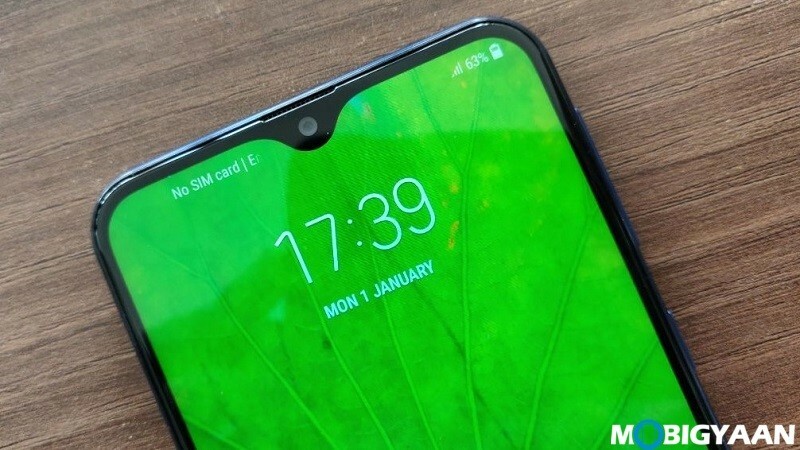 The Samsung Galaxy M20 uses a better CPU Exynos 7904 with more RAM and storage options. 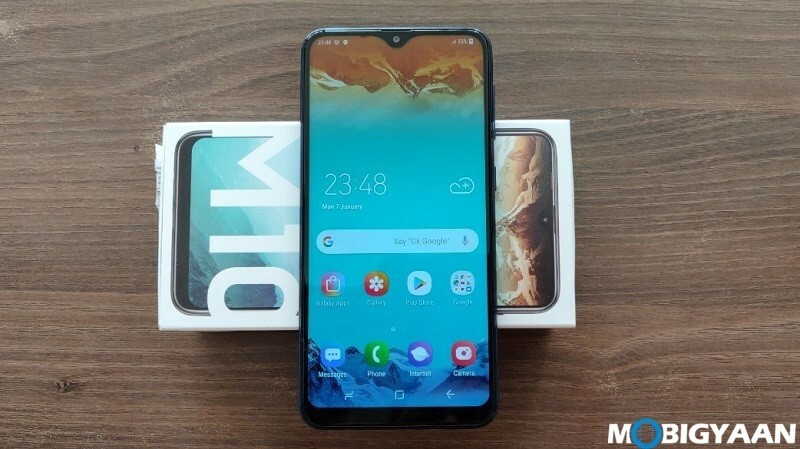 The Galaxy M10 comes in two variants, one is 2 GB RAM with 16 GB internal storage and other is the 3 GB RAM and 32 GB internal storage. The storage can be expanded via a microSD card on a dedicated slot with up to 512 GB. 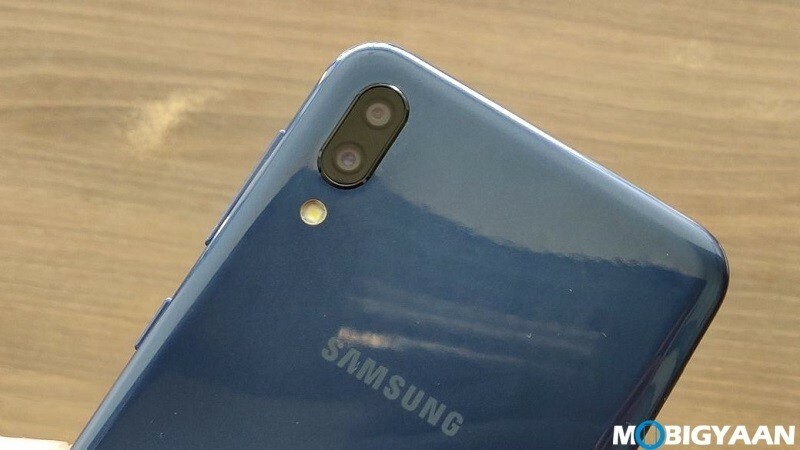 On the camera side, the Galaxy M10 features dual cameras onboard, 13 MP + 5 MP similar to the Galaxy M20. The 5 MP is actually a wide angle camera while the front side has a 5 MP camera for selfie needs. The camera supports Live Focus, Stickers, Beauty, Pro, Panorama and other camera features offered Samsung. It packs a 3,400 mAh battery and ships with a charger rated 5V and 1A. On the software side, the Galaxy M10 runs Android 8.1 Oreo layered with Samsung Experience 9.5 interface. 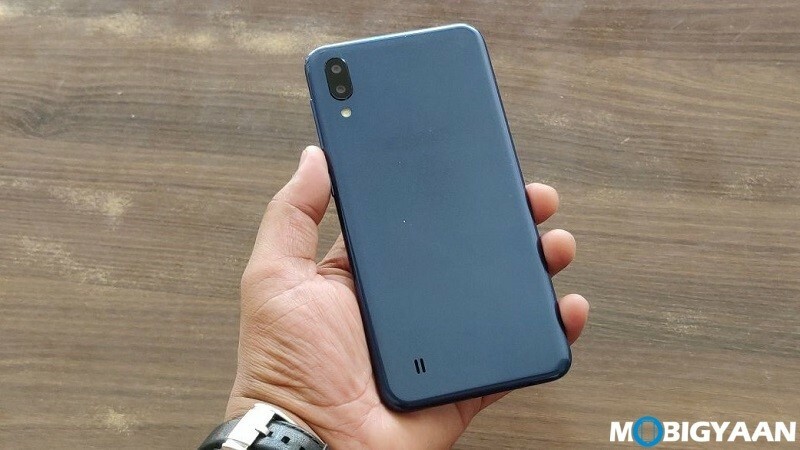 The Samsung Galaxy M10 sports a triple slot tray on the left side just like the Galaxy M20. You can put two 4G SIM cards and a microSD card separately. The right side offers power and volume keys, the bottom has micro USB, 3.5 mm audio jack, and a microphone. Another microphone is at the top for noise cancellation. The loudspeaker is at the backside of the phone. 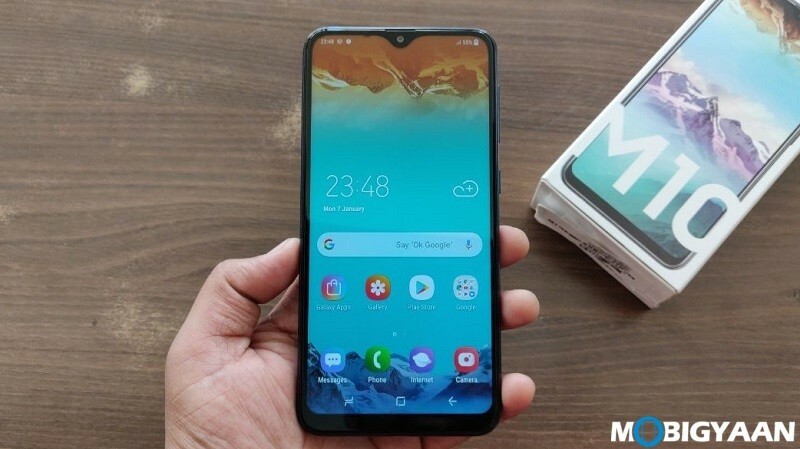 What do you think of the new Samsung Galaxy M10? Share with us under the comments.